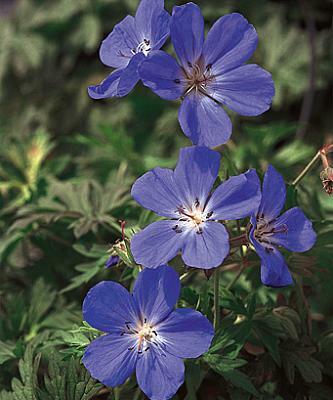 Derived from a cross between Geranium pratense and G. clarkei 'Kashmir Purple', 'Brookside' puts together the best qualities of both. Said to have a better blue flower color than 'Johnson's Blue', it offers clean, finely textured foliage on an easy-to-grow plant. It has performed so well that the Royal Horticultural Society gave it the Award of Garden Merit in 2004. The flowers are large and nearly sapphire-blue with creamy white centers, appearing in mid-summer and lasting through August and then appearing again in late fall. They're framed perfectly against lacy mounds of green foliage that turns brilliant shades for red-orange in fall. Extremely adaptable and hardy, 'Brookside' handles drought quite well once established -- this makes it an excellent choice for southern gardens! It tolerates partial shade as well, although it may lose its compact form with less light. Although the foliage may decline in August, don't fret -- this sometimes happens with hardy geraniums. Just cut them back, give them a drink, and they'll come back stronger than ever with a new flush of blooms. Try growing this in front of coarser-textured, light-colored plants in partial shade like Tricyrtis latifolia, Tricyrtis hirta 'Moonlight', or Carex 'Ice Dance'. In full sun the colors match well with coneflowers like Echinacea 'Bright Star' or brightly colored plants like Heliopsis helianthoides 'Loraine Sunshine'.